Initially I was very surprised at the lack of (visible) updates on the cars during the first few days of the final test in Bahrain, which ended some 7 days ago. However as the days passed the changes started to creep their way in to such an extent that this piece has taken a while to become available to you. Only yesterday I found out about a few more bits and pieces that Mercedes brought! So here is my final pre-season piece before Melbourne kicks off 2014 next week, hope you find it insightful! With the highest mileage of any team (just ahead of Williams) throughout winter testing, Mercedes set about further enhancing their W05 package. Having released an outwardly more complex (if not the most complex) car than any other team, refinements have been made across the car rather than all-new parts being introduced. Although this cannot be said for Mercedes’ new floor and diffuser modifications. Replacing the simplistic splitter up front is a new number, featuring two, long fences running alongside each side to guide airflow along the lower regions of the floor ahead of the sidepod. This entry was posted in 2014, Testing and tagged 2014, 29, bull, f1, f14, ferrari, mclaren, mercedes, mp4, rb10, red, review, t, tech, testing, w05 on March 9, 2014 by thewptformula. Barring Lotus, the first of two test sessions in Bahrain presented the opportunity for teams to start to delve deeper into their new cars for the upcoming season. Jerez, due to its odd track characteristics, gives teams the chance to shakedown their challengers and put mileage on the next generation of F1 machinery. In Bahrain, however, set-up exploration, race simulation and aerodynamic work start to make their way to the top of the to-do list. Although we perhaps did not see a huge amount of updates externally, there were a few notable changes to some of the cars and I am sure that many items were addressed to internally post-Jerez. The C33 was perhaps a little simplistic at the first test therefore it was no surprise to see some a host of additional bodywork make its way onto the car. This entry was posted in 2014, Testing and tagged 2014, bahrain, c33, e22, f1, lotus, mercedes, sauber, tech, testing, updates, w05 on February 23, 2014 by thewptformula. The Young Driver Test (YDT) at Silverstone had more of a purpose than a normal YDT (the last being held in Abu Dhabi in November 2012) thanks to the calamities with the Pirelli P-Zero rubber so far this year. “Young” drivers were still in abundance, but the FIA introduced a few changes to ensure the safety of the future tyres that will be introduced for Hungary next weekend. The FIA gave permission for each team to have one full day of running with either one of their driver’s or half a day for both of the drivers. Most teams took the opportunity to capitalise on having an experienced driver in the car, although they were restricted to a program set by Pirelli to clarify how the new tyre will behave from next weekend onwards. The FIA also stated that teams could not make any major setup changes (such as ride heights, rollbars, spring rates) to the cars when using a current driver to make sure that they did not gain an advantage with their current driver lineup. However small alterations such as tyre pressures and wing angles could be changed if they wanted to. Some teams chose not to field a “young” driver and instead deployed the expertise of a test driver who knows the team inside out. This is still permitted within the regulations as they do not participate in any Grand Prix weekend in the F1 calendar. Despite the slightly different rules, the normal stream of updates continued to make their way to the cars for the three-day test. It’s all well and good having updates to bring to the car, but without measuring data from these components you cannot improve the car. This is why teams build unique sensors that are designed to measure specific parameters of the car whilst it is running. These sensors generally come in the form of pitot tubes: commonly found on aircraft (next time you’re by the wing of an aeroplane, look out the window and you’ll probably see one), the tube is designed to measure airflow velocity. Teams will build varying sizes of array to accommodate a certain amount of these tubes depending on the area of the car. Above we can see an image of the Ferrari with a small arrangement of pitot tubes attached to an array. These will all be linked to what is effectively a blackbox attached to the car, receiving data from each tube about the velocity of airflow that is hitting them. The placement of the sensor will tell us what the team wants to measure. In the above case, Ferrari have placed the array in the region in which the exhaust gases will hit the floor of the car via the coanda (the behaviour of a fluid passing out of a jet and onto a surface. Hold a spoon under an open tap and see what happens to the water as it leaves the trailing edge…) and downwash effect. This will allow the team to see how changes to the bodywork or exhaust mapping can change the velocity of the flow hitting this region. Ideally they will want higher velocity flow to try to replicate the Exhaust Blown Diffuser (EBD) effect that was banned after 2011. Many teams placed a large grid of tubes at the section just beyond the airbox and over the sidepods to measure the flow coming off of various components. The front wing will have a large impact on the flow rate at this section of the car as it is chucking large volumes of turbulent air upwards and backwards towards the rear of the car. The tubes will be able to measure the speed of this flow and the engineers may be able to decipher how this will affect components downstream, the rear wing for example. There are other sensors, too. Teams commonly use infrared sensors to measure tyre temperatures but there are also other interesting devices. Lotus use device called the Kistler RoaDyn. The Enstone outfit have been utilising this system for a few years now and it appears to be a good tool for them. The RoaDyn measures four parameters of the wheel in all three axis: pressure; force; acceleration; torque. The measurements the devices gather will determine how the tyre behaves as the car travels around the circuit. This sensor would have been very useful for the YDT at Silverstone because of the new type of tyre that they are testing. The sensors above will have been used for a wide variety of objectives, and constant straight-line speed runs will gather the appropriate information needed to alter any designs on the car. McLaren were no exception to this, but also implemented the now widely used Flow-Visualization (Flo-Viz) on a slightly updated front wing and turning vanes. The team tested their current front wing with new mounting pillars. They are longer than their predecessors, stretching back as far as legally possible (in line with the trailing edge of the wing endplate) to guide flow more directly to the T-Tray. McLaren sprayed the wing with Flo-Viz for analysis. The appearance of the Flo-Viz paint appeared to be quite uniform and the flow does not appear to detach which is a good sign. However it would be very rare for airflow to detach here as it is passing over an element that is placed vertically rather than horizontally. The Flo-Viz will be particularly useful to show how the flow behaves across the pillar and where it leads to afterwards. The team also returned to using the three-element turning vanes beneath the chassis. They were abandoned after the Jerez pre-season test because they did not allow easy access to the key components of the pullrod suspension layout beneath the chassis, leading to longer setup change time which compromised running time. Perhaps McLaren now feel that this season is dead and buried and it is worth concentrating further on aerodynamic development for next season, or they have found a go-to setup that does not require a lot of messing around with during the race weekend to get the car in tune with the driver. Another theory is that the new tyre construction coming for Hungary does not interfere with the flow structures of the turning vanes. McLaren believe that the current 2013 tyre construction has a huge influence on the aerodynamics of their car due to the softer sidewalls interacting with the bodywork in ways that were not anticipated. With the harder sidewall tyre coming in next week, we could see them move up the grid. The Woking based outfit added an additional vortex generator fence to the top of each sidepod, making a total of six (three each side). This should boost the downwash effect over the exhaust plume, aiding the EBD effect and sealing the gap between the rear tyre and the floor/diffuser wall. Each fence reacts with eachother to produce a net vortex, therefore simply adding fences on top of the sidepod will not necessarily give the car more downforce. McLaren concentrated heavily on the crucial region where the exhaust plume makes contact with the floor near the rear tyre. They coated this section of the floor with a blue material. I may be incorrect, but my guess is that the blue coating has a melting point similar to that of the temperature of the exhaust gases that are reaching this area of the car. Rather than relying on an infrared camera, the engineers will be able to visibly examine how the gases interact with the floor and how the temperature is spread along its surface. The designers can then make changes to the vortex generators, sidepods and engine mapping to meet a desired criteria. On Thursday, the team examined the same area of the car but with a different sensor. These horizontal sensors may be able to read pressure and temperature, effectively mapping how the exhaust gases change within these parameters along this stretch of the floor. This is the same idea as the blue coating but data can now be collected on the area as well as examined visible evidence. Sauber introduced an all-new full coanda exhaust system at the YDT. It featured an under-tunnel but retained its exhaust bulge from the previous system where the ramp now extends downwards from. I have tried to explain how it works in the diagram above. The yellow line, dotted as it passes through the tunnel, is airflow coming from around the sidepod. The red area represents the exhaust plume (although I would expect it to be firing out at a steeper angle) and the green line shows the airflow coming over the top of the sidepod pushing down onto the plume – downwash. Sauber previously had a semi-coanda exhaust system, whereby the exhaust gases had to “jump” from the sidepod down to the floor whilst flow still passed beneath it. There was no tunnel on the previous system. The system they are now using was pioneered by Red Bull last season, although it tends to work better for Renault-engined cars. Sauber also appeared to be trialling their Drag Reduction Device (DRD) for the first time since pre-season testing. The device utilises ears each side of the airbox, like the Lotus system, to trigger a fluid switch within the engine cover of the car at high speed, sending air up the vertical column, in to the low pressure region beneath the rear wing and stall it. 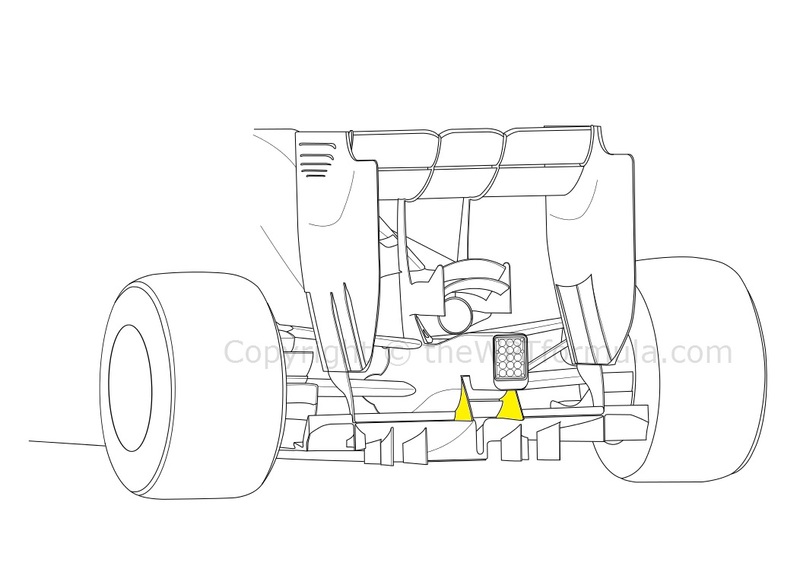 Where the Sauber system is different is where the airflow exits when the device is not active. On other cars we see ductwork exiting the engine cover and beneath the Y75 Monkey Seat winglet. Sauber however have been able to tap unwanted flow off within the engine cover, exiting at the same place where air cooling the engine and transmission would be released. Lotus continued their work with their race-proven DRD at Silverstone this week, with the device’s debut race at the very same venue last month. The system was no different (as far as I could tell) from that used recently, but the image above shows some key features of their device. The yellow circle highlights a number of holes within the stalling column of the system. At speeds just below the activation point of the device, some airflow still leaks up the stalling column instead of exiting beneath the Monkey Seat duct, which can disturb the rear wing’s downforce. These holes bleed off this unwanted flow before they can reach the bottom of the wing. When the device is active, the pressure within the stalling column can overcome these small holes and will therefore not greatly effect the stalling of the wing. The orange arrow shows how the pillar is attached to the base of the rear wing. This could be acting as a stabiliser at high speed, reducing the movement of the pillar and therefore increasing the stalling effect. Toro Rosso also evaluated their DRD for the first time this week. Despite claims that they tried such a system in Abu Dhabi last year, I have been informed that this is incorrect. The system is quite clever as all of the components that produce the switch effect within the device are all hidden inside of the engine cover, much like Red Bull’s when they debuted it (in Abu Dhabi, incidently). This entry was posted in 2013, Testing on July 21, 2013 by thewptformula. With HRT out of the equation, that leaves just Marussia and Caterham fighting for the penultimate and last places in the 2013 season. The two teams chasing the midfield bunch have a lot to play for as they appear to be continuing their battle for 10th spot in the Constructors’ championship. The difference between 11th and 10th position is worth literally millions of pounds, so grabbing that place will be extremely important for next season as the new regulations come in. Whether either team can find that extra step to bring them up to the establishment will always remain an uncertainty, but the two teams are making (very) steady progress in putting the foundations down to do so. This post will highlight the key updates that both teams have brought to the final test and most likely to the first round in Australia. Having secured 10th place in the dying moments of last year, Caterham have arguably always had the upper hand over any of the “new” teams since their birth as Team Lotus in 2010. However, pre-season form has suggested that the team have stayed relatively static in terms of performance whilst Marussia have made leaps and bounds over the winter. Having not brought anything substantial to the final test (a large update is due for when the European races start – Barcelona, incidently), I shall go over some of the key components on the CT03. Exhausts have been the main talking point around the CT03. The top image shows the exhaust channel as seen in Jerez and the first Barcelona test. It features an aerofoil that runs the width of the channel. 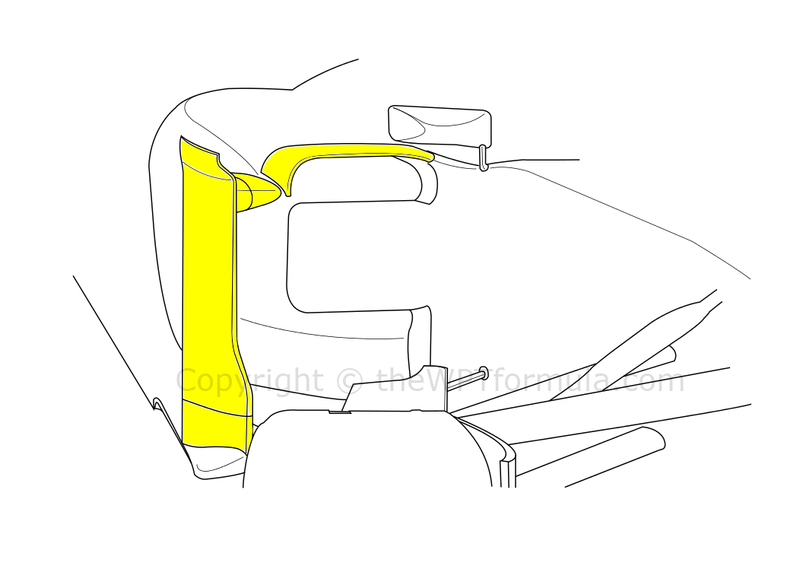 The aerofoil is designed to further push the exhaust plume downwards towards the floor, increasing the downwash/coanda effect that teams have been exploiting since last year. The FIA have since clarified that as this device is within the imaginary conical region that prohibits the use of bodywork to manipulate the exhaust gases, it is therefore illegal. The bottom image shows that the aerofoil has been removed. Caterham had no choice but to remove it, but I doubt they will lose too much performance because of this. Obviously it would not have been there unless there was performance to be had, but the reduction of this device can be easily recovered elsewhere on the car. Caterham have further developed on last season’s front wing. The wing features four elements in total, two of them created from splitting the top flap close to the endplate. Having more elements increase the consistency of the airflow along the gradient of the wing, so I expect to see this area being further developed across the season as most teams have at least five elements in this area (Ferrari have seven in total along the endplate area!). Also evident in this image is the cascade winglet arrangement. The element that attaches the main winglet to the endplate (spanning from the ‘McG’ logo) is angled downwards, which indicates that it is trying to turn more flow around the front tyre by accelerating the air over this bodywork and into the endplate. The small horizontal fin attached to the main winglet is used to guide flow coming off of the top flap inside of the front tyre and efficiently through the front suspension arrangement. 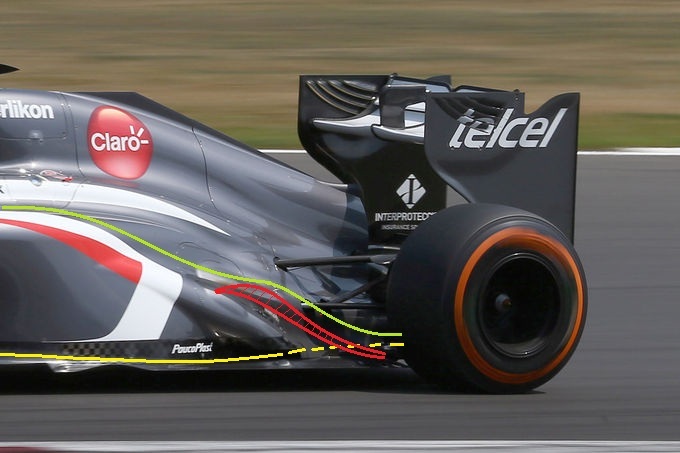 The CT03 features a stepped nose without a modesty panel (see my post about them here – https://thewptformula.wordpress.com/2013/02/16/analysis-modesty-panels/), only Lotus have opted to do this along with Caterham. Having said that, both Lotus and Caterham had the most efficient stepped noses from last year, so carrying them over will reduce weight at the front axle without costing them too much of an aero-penalty. The CT03 is very much an evolution of last year’s car, but the team have added three vertical fences that generate vortices along the length of the sidepod. This vortices aim to increase the downwash effect upon the exhaust plume further. What I find interesting about them is that they are very high. The height of these fences are generally determined by the thickness of the boundary layer of air that lines the top of the sidepod inlet (McLaren had low-lying fences on their sidepods last year). This indicates that their sidepod design is compromised in that it produces a large layer of boundary flow, suggesting that they are having issues managing the airflow coming over the top of the chassis and also handling the wake from the front tyre that is induced at high-speed. Marussia have done the complete opposite to Caterham and have introduced a substantial upgrade package to their MR02 for the first race. Above shows an image of the launch version of the 2013 challenger. It features and extremely rounded engine cover with a very thick surface area in comparison to almost every other team on the grid. This made the car look very long, but I am told that the wheelbase is exactly the same as last year’s car. In this image we can now see the addition of a shark-fin style engine cover that is very similar to one that Williams have been running for the past few years. This should guide airflow coming off of the airbox area more directly to the central section of the rear wing, producing cleaner flow and increasing the efficiency of the wing. This also leaves area to develop the cooling exit that many teams have at the back of the car that opens up right onto the centre of the beam wing. Above we have an image of the front wing that the MR02 was running during Jerez and Barcelona. It is a direct copy (as far as I can tell) from last year’s car, featuring four elements and very simple endplates. Below shows the new design. The endplates have been broadened by increasing the width of the footplate, allowing a turning vane to placed upon it in order to aid flow around the front tyre and into the sidepod area. The cascade winglet has a small detail in that it dips downwards as it meets the vane, a common feature on many of the cars that was pioneered by Ferrari. The wing is still four elements but has been profiled much differently: all of the elements of the wing bend downwards to meet the footplate, creating slots all the way across the front wing. This is to increase the consistency of the flow which should induce more downforce as well as better direction of flow over the rest of the car. Also new are the slots at the inboard tip of the flap. As seen on the Lotus last year (and copied by many teams), These intricate pieces are also designed to control airflow coming off of the flap and direct it effectively back over the suspension. Note that a gurney flap has been placed across the majority of the trailing edge of the flap except the most inboard part. This has been done as another measure of guiding flow backwards. Thankyou very much for reading this. Any feedback would be great and enjoy this coming season! This entry was posted in 2013, Testing on March 14, 2013 by thewptformula. A week to go until lights out Down Under, as this post explores the updates that the midfield teams have added to their cars to try to propel them further towards the leading pack. Williams have been one of the many midfield teams that have made significant design changes to their car. You can see my analysis of the launch of the FW35 here – https://thewptformula.wordpress.com/2013/02/20/williams-fw35-launch/. Since then the team have introduced a number of updates to hopefully build on a solid 2012. The biggest change to the car was the introduction of a Red Bull-style, full coanda exhaust system and getting rid of their previous semi-coanda (McLaren-style) solution with its controversial turning vanes. This change appears to be due to the Renault engine’s driveability and engine mapping and correlates with the fact that Lotus have also adopted this system. Having a full coanda ramp will allow the exhaust plume to be more efficiently guided to the area between the rear tyre and the floor edge by the downwash atop of the sidepod, but compromise the airflow from the undercut area feeding into the “coke bottle” region (where the bodywork narrows to meet the gearbox fairing). The tunnel beneath the ramp is very small in comparison to the Red Bull and Lotus versions, although the jury is still out as to whether it is worth tunnelling the flow beneath the ramp anyway, as Red Bull have been taping up the tunnel during testing for further analysis. This image shows how small the tunnel is (to the left of the Williams F1 logo). Also worth noting here is the small fence guiding the exhaust gases to the inside of the rear tyre. The small bulges in the floor are infrared sensors that monitor tyre and floor temperatures. The team also continued to evaluate the two nosecone options (the launch version and a slightly lowered profile with the two camera housings attached in a hammerhead shark arrangement) and multiple front wing options. By the final day they had settled for what appeared to be the parts seen on the launch car. Williams also continued to evaluate their blown wheelnut concept. In the above image, the right picture shows the launch version of the hollow wheelnut complete with duct-work. On the left we see that they have slightly modified the angle and shape of the duct, creating a half-moon shape that covers roughly two thirds of the hollowed are angled very slightly upwards The duct also exits much closer to the edge of the wheelnut. These two characteristics suggest that they are trying to manage the wake that is induced from the top of the tyre, which may influence the way the downwash works along their new sidepod configuration. Sauber brought very little in the way of major changes to the final test which shows that they must be satisfied with their small sidepod layout. It is interesting to see that despite having very small sidepods, the rear of the C32 is not as compact as almost all of the teams on the grid. This is probably because of the packaging restrictions that come with a new aerodynamic layout, as there are probably more issues in extracting hot air from the car in the tighter regions. Although the new rear wing was introduced at the first Barcelona test, I thought it would be worth mentioning. The dipped central profile was used in conjunction with their own DRD device to try to stall the wing across a larger region. However, the team also ran this wing without the device as seen in the image above. Perhaps Sauber are getting a lot of blockage from their airbox which is not allowing enough substantial airflow to reach the central section of the rear wing, hence why they have profiled the wing in this way. The airboxes on all of the cars are the same surface area (despite their appearance) so I thought this was an interesting concept. I have not seen enough images to justify this evaluation, but it could well be just the lower section of the wing that has been lowered rather than the whole of the profile. If we look at the top of the leading edge, it has very little curvature in comparison to the bottom. This suggests that, although there is a dip in the profile, it could just be the underside dropping away more than the top side. This may help accelerate flow beneath the central section and create lower pressure, but I am no expert. Toro Rosso made a few subtle changes to their STR08 for first round. Unfortunately I do not have the images available to fully analyse these adjustments but I will do my best to describe and explain them to you. This image shows the launch version of their rear wing, complete with strakes that are suspended from the endplates. The idea of the having strakes here is to expand and condition the airflow coming off of the rear tyre and brake ducts, working the inside of the rear wing endplate more to generate more downforce. Toro Rosso slightly changed the profile of the endplate and number of strakes for the final test, as well as adding a slot at the leading edge of the endplate to work the underside of the wing. This follows on from the Williams and Marussia designs that appeared last season. The Italian team also subtly modified the wing mirror mounts, the actual mirror being vertically attached upon a horizontal blade, creating vortice generators that we see on many of the cars today to aid downwash over the sidepods. The continuity of deciding whether to run with or without the ‘r’ winglets stretched into the final test days. The winglets create vortices at their tips and control the flow coming off of the flap inboard of the wing and also help guide the flow from the central section of the wing towards the T-tray. Another slight modification was the addition of an extra strake hanging from the each of the rear endplates, making a total of four slats. Force India also acutely changed the angle of the exhaust fairing relative to the floor. This was probably made to increase the downwash effect upon the exhaust plume, as they may have found the plume was being directed too far into the rear tyre. This should also solve any issues of overheating the rear tyres if they had any. This entry was posted in 2013, Testing on March 10, 2013 by thewptformula.